Giving birth to a child is the most diving feeling that a woman experiences. However, there can be times when she becomes pregnant without having any want for a child. In such cases, she has many options available with her to abort her pregnancy or to limit the possibility of having a child. Among the many alternatives available, most of the women choose birth control pills. How Do Birth Control Pills Work Against Pregnancy? The birth control pills work in different ways against pregnancy. Some pills develop a lining around the womb which restricts the flow of fertilized eggs to the ovaries. Others may thicken the cervix mucus that does not allow the sperm to meet the fertilized eggs. They can also control the rise of estrogen which is responsible for the release of fertilized eggs. Is There Any Link Between Hair Loss And Birth-control Pills? Not all women get exposed to hair loss by birth control pills. 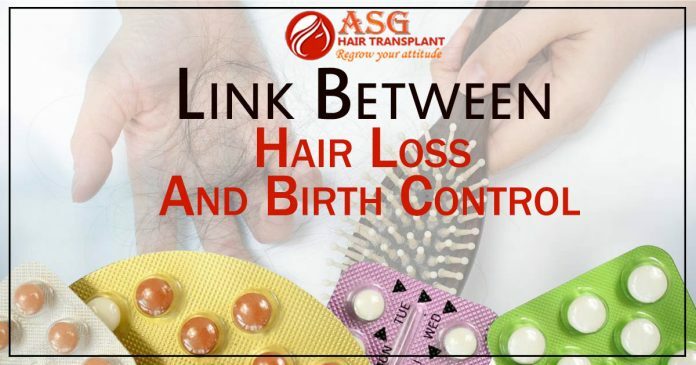 But those who face hair loss from birth-control pills are subject to this either because of their extreme sensitivity to the hormones present in the bills or due to hereditary hormonal-related hair loss. The hair growth takes place in three cycles namely anagen, catagen, and telogen. Anagen is the cycle of active hair growth where hair growth takes place naturally from hair follicles. This stage lasts for a period of 2 to 7 years. Catagen is a temporary stage of transformation where the hair growth does not take place for 10 to 20 days. Telogen is marked by the resting phase of hair. The hair growth is discontinued totally during this phase. Rather, there is hair fall which can range from 25 to 100 hair falling per day and this can extend up to a period of 100 days. When the woman takes birth control pills, the hair switch from their active phase to resting phase too soon causing excessive hair fall and hair fall before time. This hair fall persists for a longer period of time and is called telogen effluvium. If baldness is a hereditary issue, the hair fall can become even more severe due to birth control pills. All in all, birth control is not solely responsible for hair loss but it can speed up the process of hair fall. So thus if this problems gets out of hand one should consider hair loss treatments such as hair transplant, hair oils, ayurvedic measures. Previous articleIs Cleansing Conditioner Also A Reason of My Hair loss?